We’d love your help. Let us know what’s wrong with this preview of A Single Woman by Maggie Christensen. Isla Cameron. headmistress at an elite girl’s school in Glasgow, is determinedly single, adroitly avoiding all attempts at matchmaking by a close friend. Widower Alasdair MacLeod is grieving for the wife he lost two years earlier, struggling as the single father of two teenagers, and frustrated by the well-meaning interference of his in-laws. When a proposed school trip to F Isla Cameron. 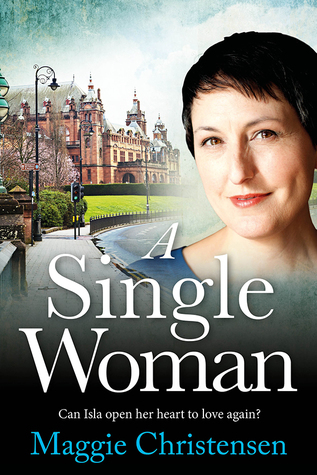 headmistress at an elite girl’s school in Glasgow, is determinedly single, adroitly avoiding all attempts at matchmaking by a close friend. As their friendship grows, Alasdair struggles with his increasing attraction to the elegant schoolmistress, while Isla harbours concerns about the complications a relationship with him would bring. Can Alasdair overcome his natural reserve, and can Isla open her heart to love again? To ask other readers questions about A Single Woman, please sign up. I've read The Good Sister and Isobel's Promise so I was really looking forward to A Single Woman and it didn't disappoint. As the book is set in my home town of Glasgow I could relate to a lot of the street names and landmarks. The characters are so believable and easy to relate to. Thank you Maggie for another great story about love in the later years of life. Romance at its best. Isla teaches at a private school. She’s definitely single and surprised when love comes her way. Loved it and shouldn’t be missed out once it’s released. After a career in education, Maggie Christensen began writing contemporary women’s fiction portraying mature women facing life-changing situations. Her travels inspire her writing, be it her frequent visits to family in Oregon, USA or her home on Queensland’s beautiful Sunshine Coast. Maggie writes of mature heroines coming to terms with changes in their lives and the heroes worthy of them. From he After a career in education, Maggie Christensen began writing contemporary women’s fiction portraying mature women facing life-changing situations. Her travels inspire her writing, be it her frequent visits to family in Oregon, USA or her home on Queensland’s beautiful Sunshine Coast. Maggie writes of mature heroines coming to terms with changes in their lives and the heroes worthy of them. From her native Glasgow, Scotland, Maggie was lured by the call ‘Come and teach in the sun’ to Australia,where she worked as a primary school teacher, university lecturer and in educational management. Now living with her husband of thirty years on Queensland’s Sunshine Coast, she loves walking on the deserted beach in the early mornings and having coffee by the river on weekends. Her days are spent surrounded by books, either reading or writing them – her idea of heaven! She continues her love of books as a volunteer with her local library where she selects and delivers books to the housebound.